The smiles and laughter of the children as they delight in playing with a large, colorful parachute is testimony to how much fun parachute games are! Parachute play can be effectively combined with musical play for added enjoyment and learning. Valuable aspects such as teamwork, cooperation and inclusiveness are all shared benefits of both music and parachute play. The parachute creates an instant circle, allowing everyone to feel a part of the group and encouraging eye contact and interaction between all participants. 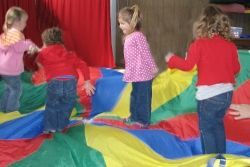 Parachute play can be used to add an exciting element to singing games or music and movement activities. Games can be played for fun, or to highlight and reinforce musical concepts. Parachute play is also energizing, helping children switch on their brains for more focused learning. It is helpful to go through the song or activity slowly first to ensure everyone understands the concepts involved with the game. Practice a few basic parachute movements such as lifting it together on the count of three, shaking it, holding it still, etc. If there are not enough handles for every child to hold on to one, you may ask all the children to hold on to the edge rather than a handle, or at least explain beforehand that it doesn’t matter whether you hold a handle or the edge. Some young children may find their first exposure to a large parachute a little overwhelming. Ensure you introduce the parachute with some quieter and less vigorous activities while children familiarize themselves with it. Explain to the children how parachute play involves cooperation or working together in order to make it work. Visit the above link for some fun songs to use with parachute play. Most children find playing with a parachute very exciting and therefore there is the potential for children to become over-excited. 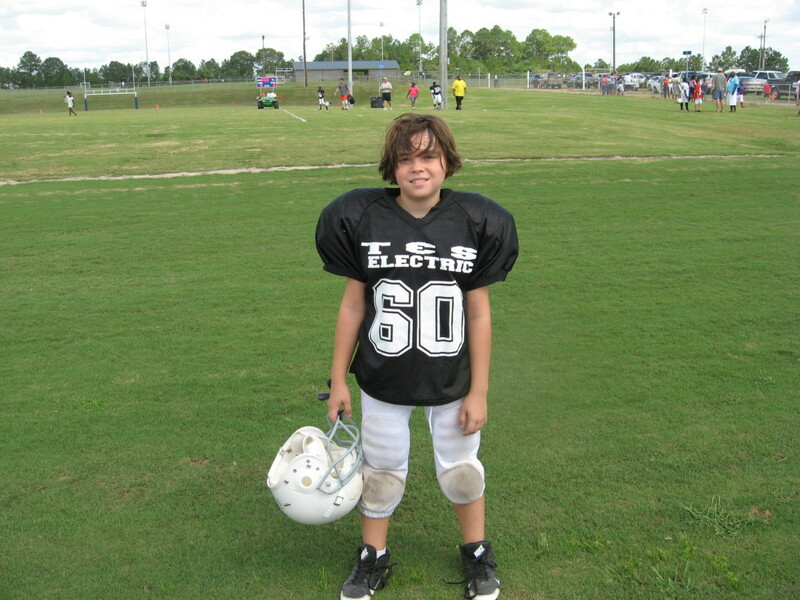 Before playing, establish or remind children of some basic safety guidelines. For example, remind children to "always keep holding on to the parachute" (unless letting go is part of the game!) It's a guideline that helps prevent children running underneath or on the parachute and getting chaotic. Always finish with a quiet, settling song or activity with the parachute. Singing Games for Parachute Play - A collection of 34 fun songs and games for children of all ages! 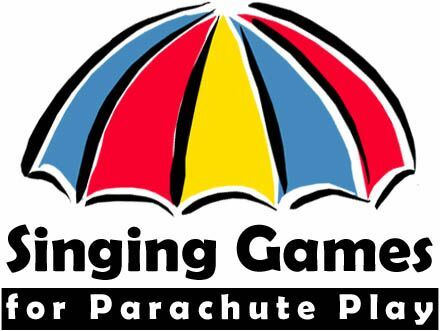 Singing Games for Parachute Play is a brand new collection which includes original and traditional songs, written or adapted specifically for parachute play. Innovative and practical! This is a must-have resource for anyone working with children. Learn a whole new repertoire of exciting songs and games and never be wondering what to do with that parachute again! Right now FREE mp3 audio demos of all the songs in the book are being offered as a bonus when you purchase the e-book. You can download them immediately and start having fun with the games straight away. You can also get a free preview of the book that contains two free parachute singing games. Head over to www.KidsParachuteGames.com and discover this treasure-chest of songs and games. Click Here to get your FREE preview of Singing Games for Parachute Play! Listen to music that contrasts between slow and fast. During the slow music everyone lifts the parachute up and down together slowly. During the fast music everyone shakes the parachute quickly. Children LOVE this fun parachute game which contrasts slow and fast movements. It's a must-have in your parachute games repertoire, especially for young children. Children get to take turns jumping on the parachute while everyone else makes waves. A FAVORITE among many groups. The kids will request it over and over again. If you don't know this parachute singing game then head over to www.BeatBoppers.com and find out how much fun it is. 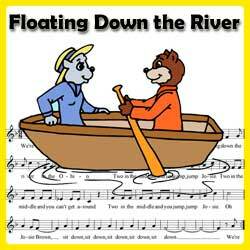 CLICK HERE to check out the exciting game of "FLOATING DOWN THE RIVER"
A must-have in your parachute games repertoire! 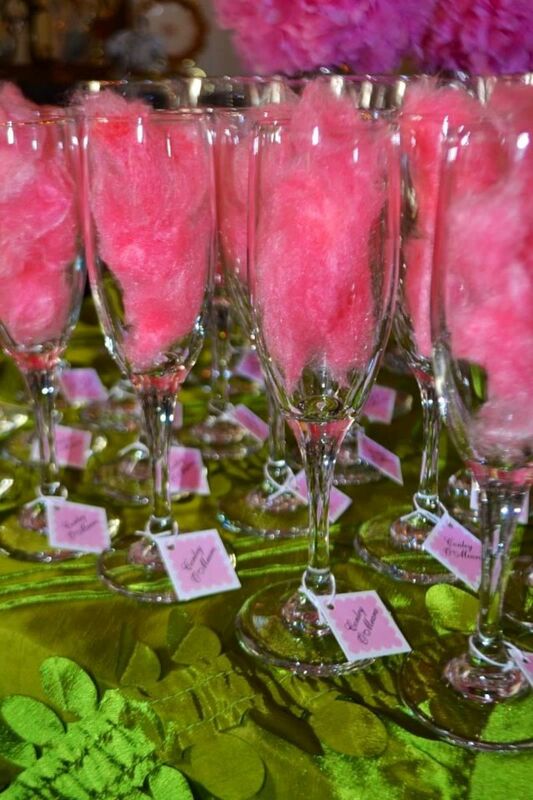 This is a favorite with children of all ages. Place some plain white cotton-balls on the parachute and shake the parachute to some upbeat music. The 'popcorn' will pop and bounce around. A fantastic piece of music to use with this activity is "Popcorn" (see link below). A lot of the 'popcorn' will fly off the parachute during the game (which is half the fun!) but let the group know it will be picked up at the end of the game. If people let go to pick up the pieces during the game, all the 'popcorn' will fall off in the gaps where people have let go. Before playing, remind children to keep holding on to the parachute till the end of the game. Children also enjoy picking up the popcorn together at the end of the game. If you're looking for a really fun parachute game, don't miss this one! 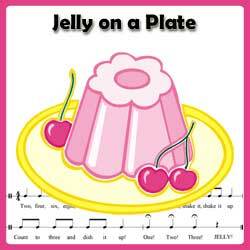 CLICK HERE to learn more about the fun game of JELLY ON A PLATE! The versatile and fun song, Mango Treats, is available FREE at www.BeatBoppers.com and it lends itself well to parachute play. One (or several) children jump or dance in the middle of the parachute while the other children, seated around the parachute, make waves by shaking it up and down. At the end of the song the teacher sings the name of a child to jump out and a new child to jump in. Click on the link below to go to the free download page. 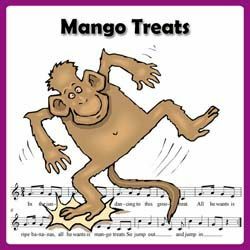 CLICK HERE for your FREE mp3 and teaching notes for MANGO TREATS! You'll find lots of activity ideas for this song in the download. Bring new life to the simple game of Ring-a-Rosie! Children hold onto the parachute and circle around while singing. At the end of the song they all fall down. We all jump up! (Jump up while sliding voice from low to high and lifting parachute). Fun Songs for Parachute Play - Beat Boppers offers a collection of songs for young children, including many fun songs for parachute play. Visit the link below for more songs and musical activities for children. Searching the site for "parachute play" will bring up a list of exciting songs to use with the parachute. Click on the above link to visit Beat Boppers and explore the exciting collection of children's songs. Buying a Parachute - Selecting a parachute for your group depends upon the number of participants and the space available to play with the parachute. Parachutes are available in bright, colorful designs and come in various sizes including: 6 foot, 12 foot, 20 foot, 24 foot and 30 foot diameters. The smaller 6 foot parachutes are a bit too small for most groups but are suitable for a small group of toddlers to play with. Parachutes can be used outdoors or indoors, as long as enough clear space is available. Parachute play provides children with important physical activity and exercise while building gross motor skills, coordination, perceptual motor skills and muscle development. Social skills are also enhanced as children experience teamwork and cooperation. A parachute is a worthwhile investment and a versatile piece of equipment for using with groups of children for musical activities. If you don't have a parachute you can improvise with a large sheet or piece of fabric or lycra. www.BeatBoppers.com - Visit www.BeatBoppers.com for more musical fun with a parachute! I love the parachutes games. I teach playschool and it is one of our favorite things to do. Indoors or outdoors it is so much fun. Great Lens.